How odd – not one of the artists whose works comprise The Urban Landscape: Six Artists – Six Views at the Clifton Cultural Arts Center through December 5 indicates that people occupy the spaces they portray. This seems to be a curatorial decision, as the show’s defining statement says “Six contemporary painters explore the urban landscape and interstitial spaces found within.” Some of us, including your reviewer, need to go to Google to determine “interstitial” but, as we guessed, it refers to spaces between, those formed in fact by their surroundings. 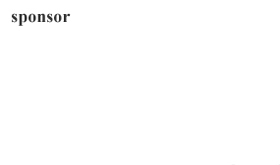 So it’s geometry this show is interested in, not the human element. Geometry proves to be a compelling subject and the people, in their absence, strongly felt. 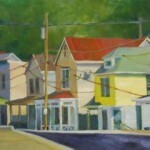 Curator Jackie Braden, whose own works form a portion of the show, paints old neighborhoods where generations no doubt have lived. She gently evokes a sense of time as well as place. “Leftovers – Myron B. Johnson Building” brings in a human name to trigger memory. I especially liked her “Top of Tenth – Newport” in which a navy blue street slopes off to the viewers’ left to go down an unseen hill, closely rimmed by houses with porches. The unoccupied porches are eloquent in themselves. Braden has a sure hand and a good eye. 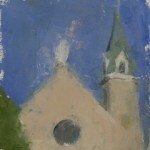 Like most of the works here, hers are primarily oil on canvas. It’s interesting to see what Erin Raedeke does with a green closely related to that of Mancini’s paintings but stronger, more demanding. 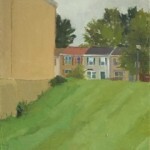 She lives now in Washington, D.C. and in her paintings here shows us the backside of a D.C. area housing development. Leftover green space beyond the fences is seen in four paintings, two hung on either side of a still life featuring “Unwanted Nature,” i.e. clippings and tools. In her statement Raedeke says she has painted “unobserved aspects of the manufactured environment.” The mower has left stripes on the grass and the buildings, seen from the rear, do little to invite. Marlene Steele’s paintings, perhaps the most compelling exploration of the exhibition’s theme, are also seen in this room. 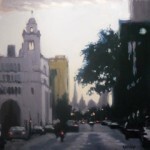 Steele is a fine painter, working in oil on canvas or on panel, and has exactly the approach this show demands. Her sense of shape relationships is uncanny. She can take a subject like “Cleaning the Site,” a messy operation involving equipment and rubbish, impose a visual order to the scene and give the whole dignity by the twin steeples of a church I think I know. Her work speaks of insistent change but gives it an underlying harmony. Work by the two other artists in the show is hung in the broad hallway of this handsome one-time grade school. 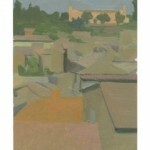 Emil Robinson’s eight paintings, oil on linen or on panel, all reflect the north Italian town of Torre Alfina. Trees soften structures, pale greens are seen throughout, windows are small (against an insistent sun?) and the skies luxuriate in blues with the brush marks clearly showing. They are engaging works, suggesting that an upcoming visit to Italy should be a plan. Perhaps the surprise of the show are the five paintings by Paul Wolven, also seen in the hallway. Surprise because while several of the artists share color sensibilities (Maureen Steele excepted; she goes her own way) Wolven pulls in a new palette of insistent blues and purples. He shows us our city (“Fifth Street,” “Clay Street,” “Sunset on Eighth Street”) as he sees it, which is jammed and busy and crowded with interesting buildings. Again, no people, but their presence is invoked by the automobile traffic that fills the streets. That’s good enough. Yes. It is and was. But this show also shares with us homely scenes that are equally art.